May 4, 2019, 4 p.m.
Creativity is alive! As we continue with our annual fashion show, we want you to see some of the world on one stage. This year’s theme, “The World Traveler”, will reflect various countries and cities but will have our special spin and vision on what that garment looks like. Our legacy as a fashion community began more than 80 years ago, and we are keeping it alive. We would like to extend a personal invitation to you and your community to join us May 3 through May 5, 2019. Our theme embodies the creative spirit of our designers and the lifestyle that our women live and represent to the world. Because our fashion show has expanded to being a vessel for cross-generational exchange, we have some special events that will reflect these various generations. We remain committed to offering knowledge regarding modesty, a space for sisterly love, and a cultivation of womanhood. 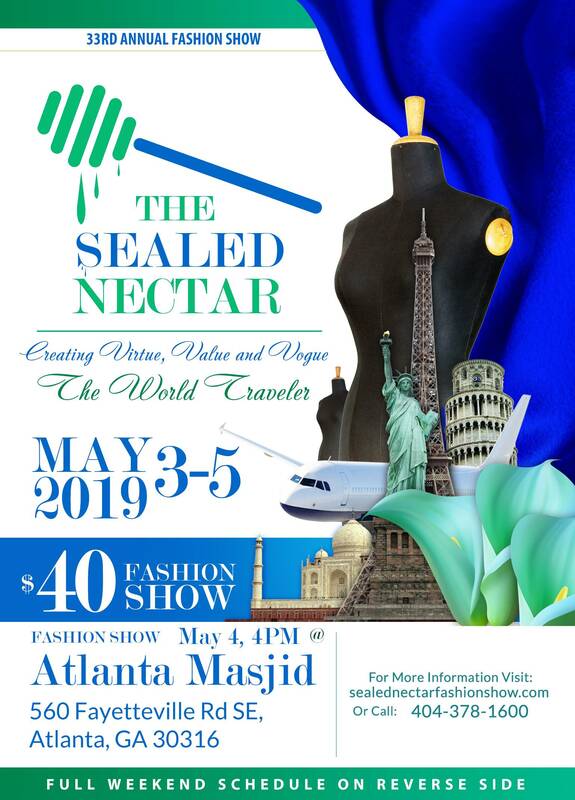 Tickets for the 33rd Annual Sealed Nectar Fashion Show, may be purchased by visiting www.sealednectarfashionshow.com. Be sure to peruse over all of the pages for a schedule of events and prices for the weekend. Please hurry because tickets are limited this year! This is more than a fashion show, so don’t hesitate to come this year. We are very excited and look forward to seeing you there, inshaAllah! Thank you! "Creating Virtue, Value and Vogue"
Edit This Event Last Edited By: Naimah Abdullah on March 16, 2019, 5:34 p.m.